You can order a printed version of our popular Country Index poster here. 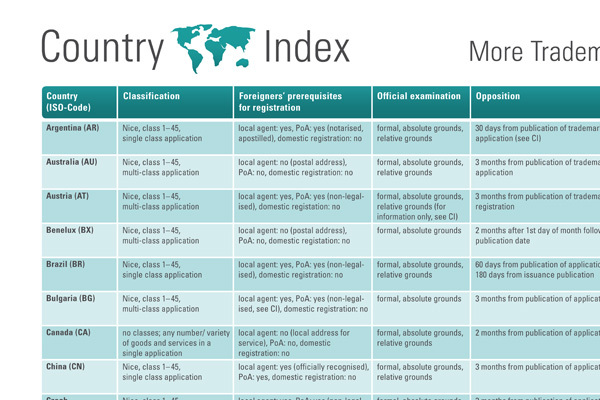 The SMD Country Index poster provides a useful overview with brief information on trademark regulations in over 40 countries. The summary table contains information on, for example, classification, prerequisites for trademark registration in foreign jurisdictions, official examination, opposition procedures, duration/renewal, protectable non-traditional trademarks as well as useful country remarks. Argentina, Australia, Austria, Benelux, Brazil, Bulgaria, Canada, China, Czech Republic, Denmark, Estonia, Finland, France, Germany, Greece, Hong Kong, Hungary, India, Ireland, Italy, Japan, Latvia, Lithuania, Mexico, New Zealand, Norway, Poland, Portugal, Romania, Russian Federation, Singapore, Slovakia, Slovenia, South Africa, Spain, Sweden, Switzerland, Taiwan, Turkey, United Kingdom, USA as well as European Community Trademarks and International Trademark Registrations. The price is 15.- EUR including shipping costs plus VAT (19 %), payable via credit card. Your data will be SSL encoded. We are sorry. The poster is out of stock. We will inform you as soon as it is available again.